“This is a book which is autobiographical in nature, with the main emphasis being the author’s time as a naval aviator during the Second World War. Had this book been published in 1945 instead of 2015, the movie rights would not have been snapped up to make it into a serial titled, “Don Winslow commands Blimpron 42.” The reader anticipating bombing the Japanese I-boats, depth-charging the German U-boats, or frustrating Italian underwater chariots, will be sorely disappointed. That said, Donald P. Venton joined the Navy as an aviation cadet late in 1942. One year later he completed training at Lakehurst and ended up a USN Ensign in Brazil, early in 1944. Most of 1944 was spent flying K-ships in Brazilian waters. Late in 1944 he was transferred to Blimp Squadron 11 stationed at South Weymouth, Massachusetts. He was onboard K-34 when it was lost at sea off Boston. Post war he remained in the Navy until retiring with the rank of Commander in 1970. As you may have intuited from the opening paragraph, this is not a tale of intense combat experiences. Don Venton came of age in the 1930s in California an enthusiastic observer of the development of aviation. He flew solo at his own expense before America entered the War began and volunteered for Naval Aviation in 1942. The standard historical cliché is that Japan began the war with superbly trained and combat experienced naval aviators while ours were competent, peacetime fliers. We were initially shocked, and then learned to cope. The Japanese were unable to train equally capable replacements for losses, while we not only replaced losses but manned multiple new CVs and CVLs as well. 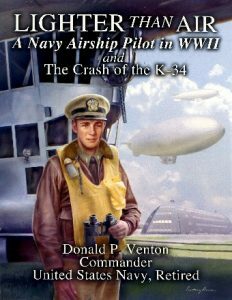 One may read Donald Venton’s remembrances of Navy pre-flight school and wonder how that was accomplished? One interesting aside: “The 18th Battalion was made up not only of civilians but also 80% of Navy and Marine personnel who had been at Pearl Harbor and Guadalcanal. With the arrival of the ex-sailors and marines, the coaches / officers learned that they could not manhandle the Cadets. The pay line became, ˜let go of me or I’ll have you court-martialed!” Also there is little evidence of speed in this training process. That said, 1944 finds Ensign Venton in Brazil flying anti-submarine patrols in K-ships. 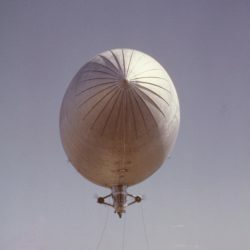 While there may not have been any actual hostile encounters, the fascinating details of blimp piloting are revealed in striking detail. If you are an author of Naval Aviation history, would be an author of WW II vintage Naval Aviation fiction, or just are curious about the nitty-gritty of LTA flying; this may well be the book for you.